As unique as you are, this set of four makes an impact with your guests that they will remember. Who else do you know has a shot glass set that is made from the resources of the mines of the Himalayans? 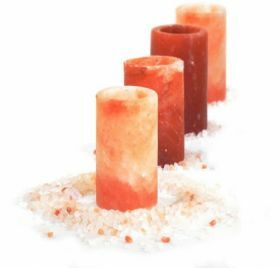 Present these 100% Authentic Himalayan Salt Shot Glasses at your next gathering and watch how popular they become. Everyone will want to take their turn! You get 4 of these with this order. Each Shot Glass holds roughly 2oz of liquid. These are not cheap glass or plastic shot glasses. These are not skinny, wimpy shot glasses. These are thick, masculine shot glasses perfect for slammers, tequila shots, fireballs... you name it. And with these, there's no need to dip the rim in salt. These are for real tequila lovers! Enjoyed by the Hollywood elite and celebrities alike. As these are 100% natural, size, shape, and color does vary. 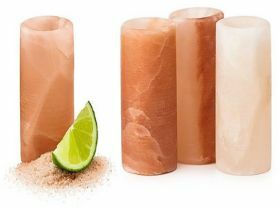 These beautifully crafted shot glasses are made from the highest quality salts. Each shot glass is made with a generous amount of salt for a dense consistency and masculine appearance. Since there’s no need to dip the rim in salt, this set is perfect for true tequila lovers! 100% Himalayan Salt.